Should Dion Lewis start over Mike Gillislee? 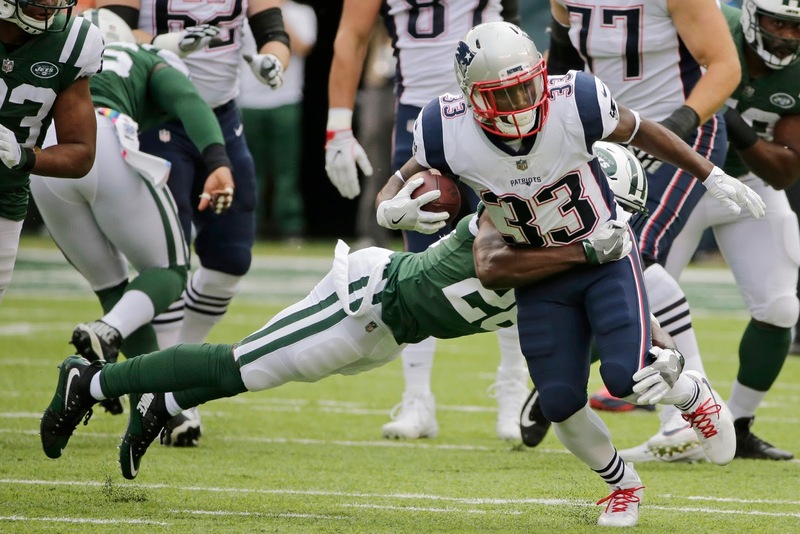 Dion Lewis led the Patriots in snaps at the running back position (29) for the first time of the season on Sunday, and he clearly merited the increased playing time. The shifty 5'8" back was surprisingly stout running between the tackles, registering 52 yards and a touchdown on 11 carries. We've seen flashes like this from Lewis before--but does he deserve the starting job after his performance? ESPN's Mike Reiss penned a piece this morning discussing Lewis' emotions after the game and supporting the idea that he should see more time on the field. He's completely correct in saying that Lewis looked transcendent on the field: after Mike Gillislee's early fumble landed him on the bench, Lewis was able to slide in and immediately make the Jets defense look completely hapless. But after sitting out 34 snaps, Gillislee returned and ran hard as well, finishing the day with 44 yards on 10 carries. Ultimately, at 5'11", Gillislee provides a different type of punch that Lewis can't. In certain situations, especially on early downs with more room to operate, Lewis is oftentimes a more effective option. But despite the fumble, Gillislee should continue to be New England's lead back for his physical ability and willingness to grind out tough yards and wear down a defense. Then, Lewis can use his agility to zigzag by those gassed defenders and force defenders back on their heels. Another key--yet overlooked--development from the New York game was the emergence of James White as the sole pass-catching back. In the first five weeks, Lewis had played a key role catching passes out of the backfield. Sunday was the first time since Week 1 (a game he only saw six snaps in) that Lewis did not catch a pass. Instead, White soaked up seven targets and converted four of them for receptions. While the Wisconsin product was always going to be the primary target, Lewis was a nifty change-of-pace and kept defenses honest in two-back "Pony" personnel groupings with both him and White in the game. It will be interesting to see whether or not Lewis manages to take that starting job for good over the next couple weeks. But at least next game against Atlanta, expect Gillislee to get the plurality of the early-down work once again and for Lewis to contribute both in the run game and out of the backfield as he has for most of the year.